Curr Biol. 2014; 24(15): 1743-1750. Evans RD, Robinson C, Briggs DA, Tooth DJ, Ramalho JS, Cantero M, Montoliu L, Patel S, Sviderskaya EV, Hume AN. In animal cells, microtubule and actin tracks and their associated motors (dynein, kinesin, and myosin) are thought to regulate long- and short-range transport, respectively. Consistent with this, microtubules extend from the perinuclear centrosome to the plasma membrane and allow bidirectional cargo transport over long distances (>1 μm). In contrast, actin often comprises a complex network of short randomly oriented filaments, suggesting that myosin motors move cargo short distances. These observations underpin the "highways and local roads" model for transport along microtubule and actin tracks. 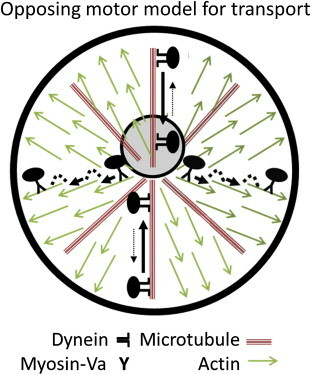 The "cooperative capture" model exemplifies this view and suggests that melanosome distribution in melanocyte dendrites is maintained by long-range transport on microtubules followed by actin/myosin-Va-dependent tethering. In this study, we used cell normalization technology to quantitatively examine the contribution of microtubules and actin/myosin-Va to organelle distribution in melanocytes. Surprisingly, our results indicate that microtubules are essential for centripetal, but not centrifugal, transport. Instead, we find that microtubules retard a centrifugal transport process that is dependent on myosin-Va and a population of dynamic F-actin. Functional analysis of mutant proteins indicates that myosin-Va works as a transporter dispersing melanosomes along actin tracks whose +/barbed ends are oriented toward the plasma membrane. Overall, our data highlight the role of myosin-Va and actin in transport, and not tethering, and suggest a new model in which organelle distribution is determined by the balance between microtubule-dependent centripetal and myosin-Va/actin-dependent centrifugal transport. These observations appear to be consistent with evidence coming from other systems showing that actin/myosin networks can drive long-distance organelle transport and positioning.